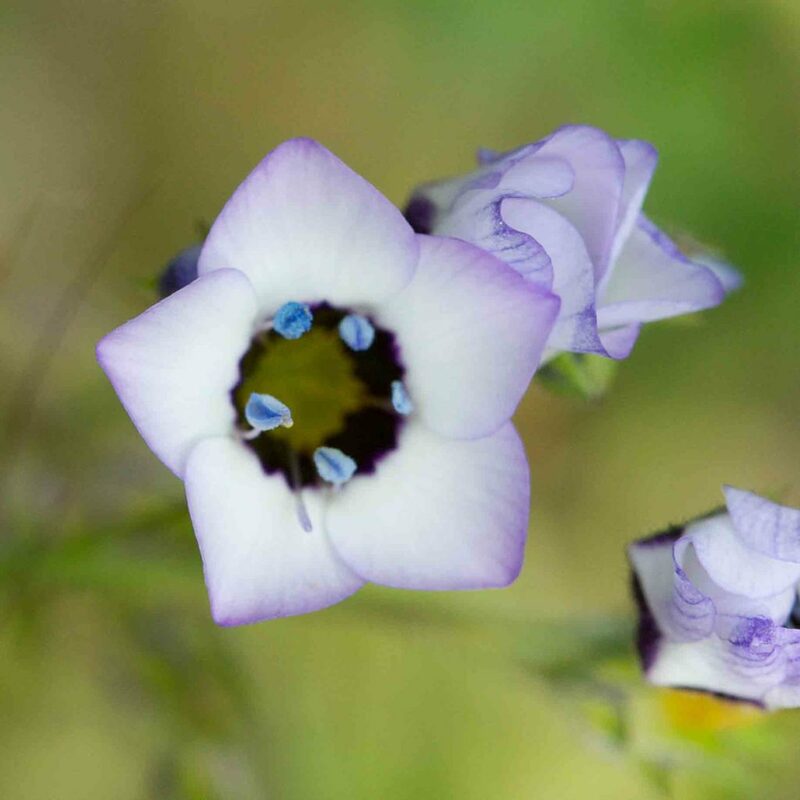 Like all members of the Phlox family, Gilia have tubular flowers, ranging from narrowly funnel-shaped to more broadly bell-shaped, all with spreading lobes (rather than distinct petals). 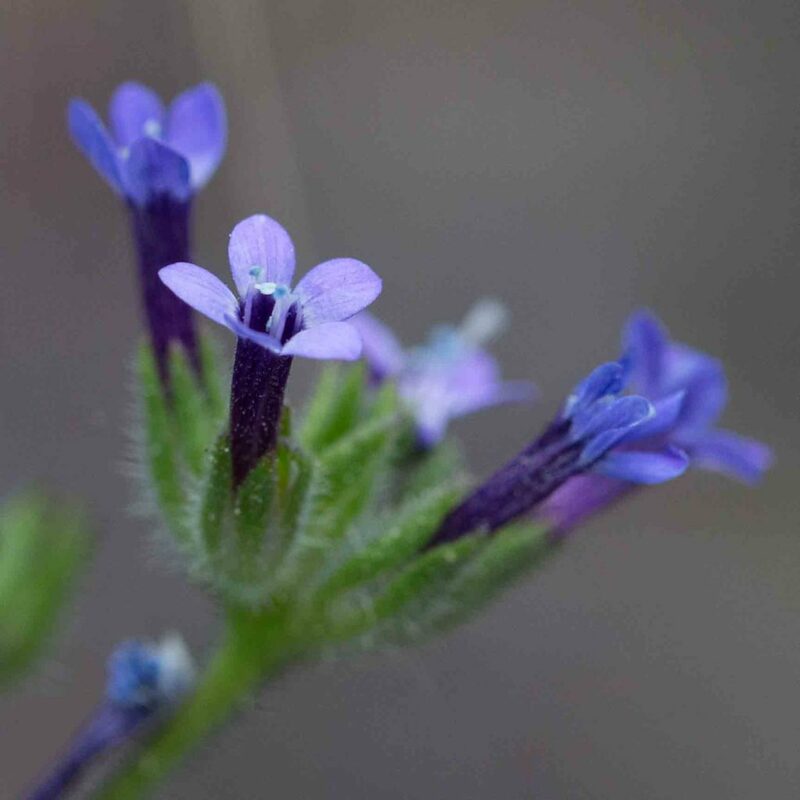 The color of the tube and/or the throat (the lower part of the tube’s interior) can be critical to identification as can the presence or absence of hairs or glands on the stems or calyx and the color of the membranes connecting the calyx lobes. 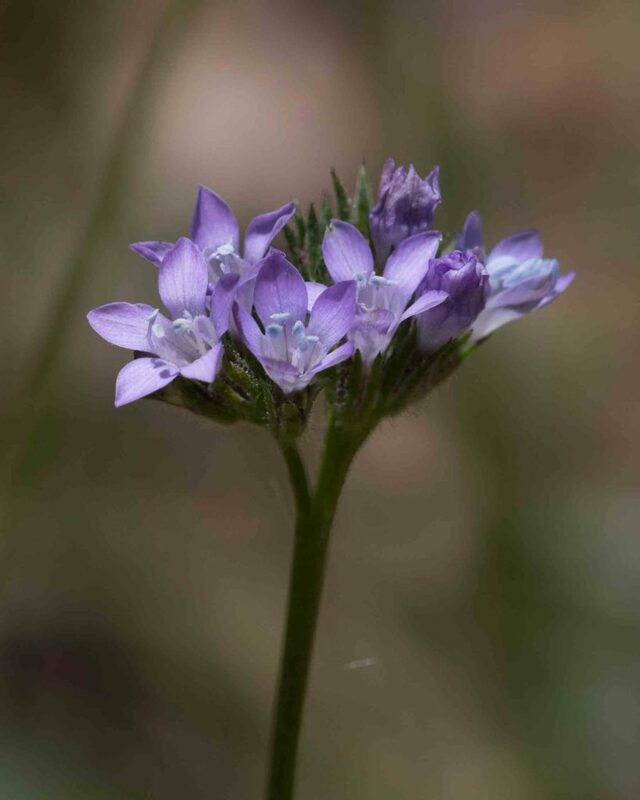 Many gilias are spectacularly beautiful but some are very small and at times challenging to identify with certainty. 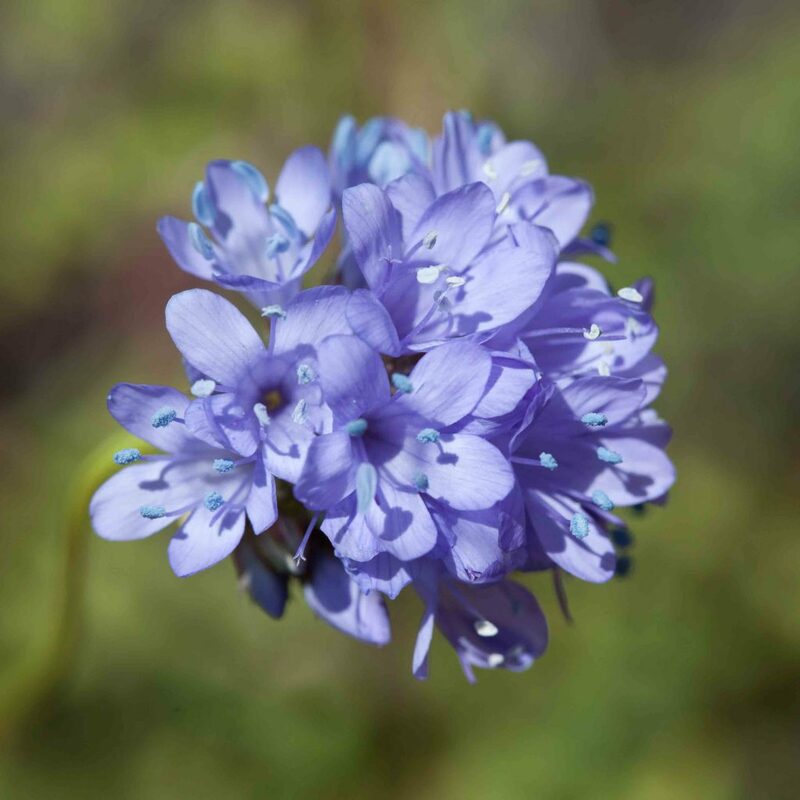 Gilia are named after an Italia naturalist, Filippo Gilii and therefore pronounced with a soft “g”. 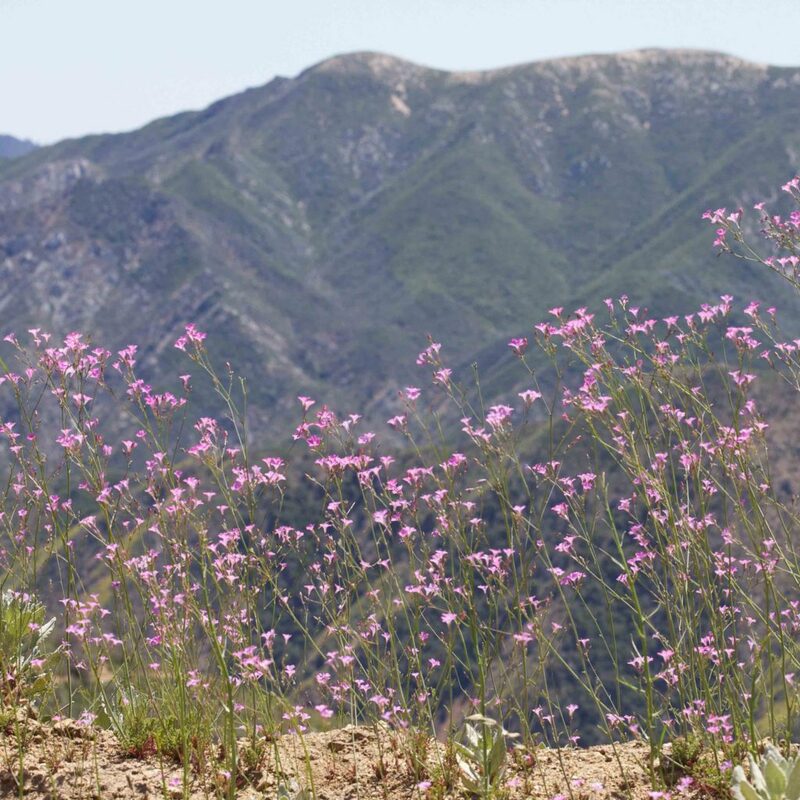 This is a loosely branched plant with gilia-like 5-lobed pink flowers in clusters of 2–8. 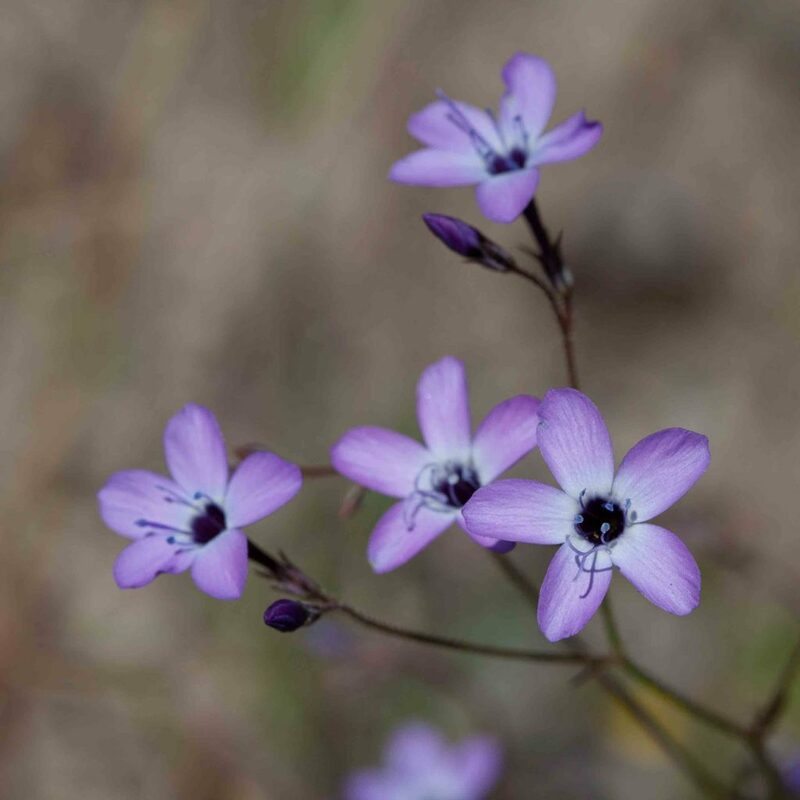 Flowers are 8–22 mm long with a well-exserted, slender, reddish-purple tube. The lower leaves are palmately lobed with the central lobe wider than the others. 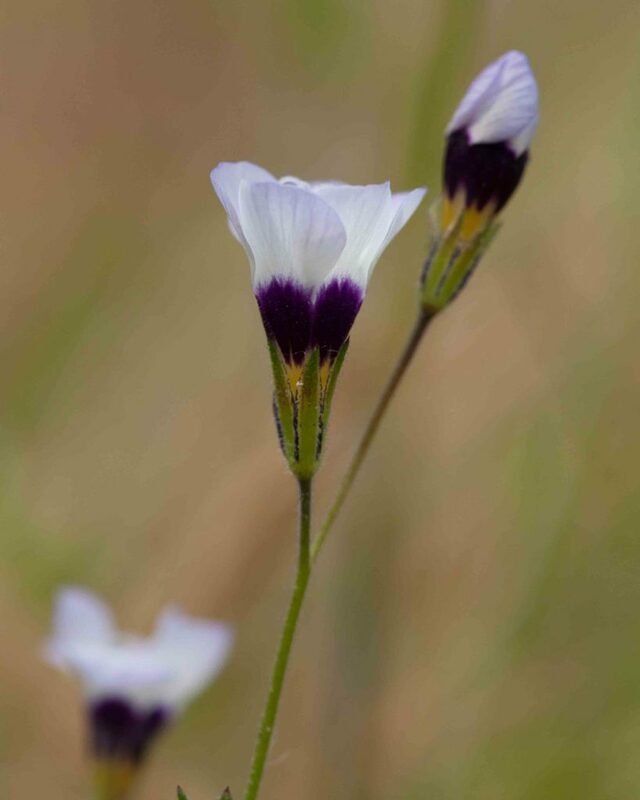 The stamens are unequal with the longest exserted beyond the corolla lobes. 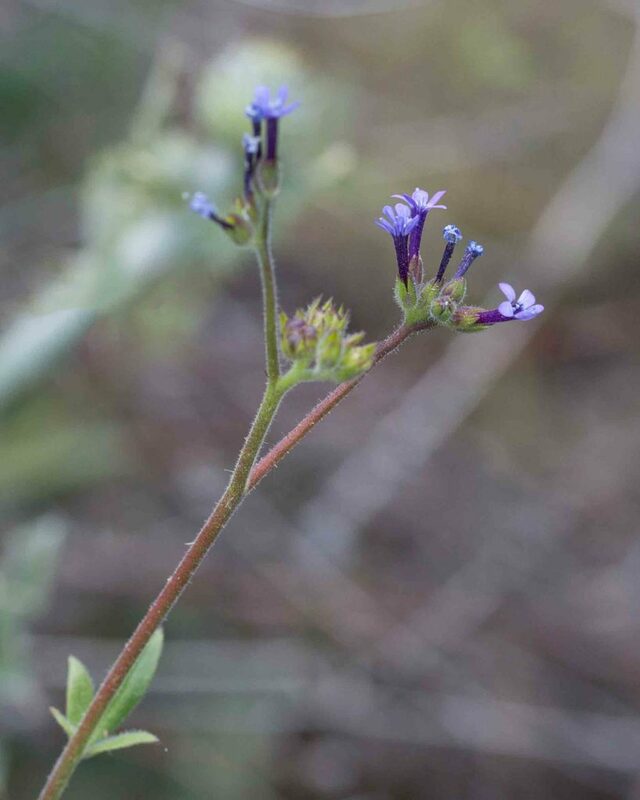 Stems and calyces are noticeably glandular, the glands on the stems having long stalks. 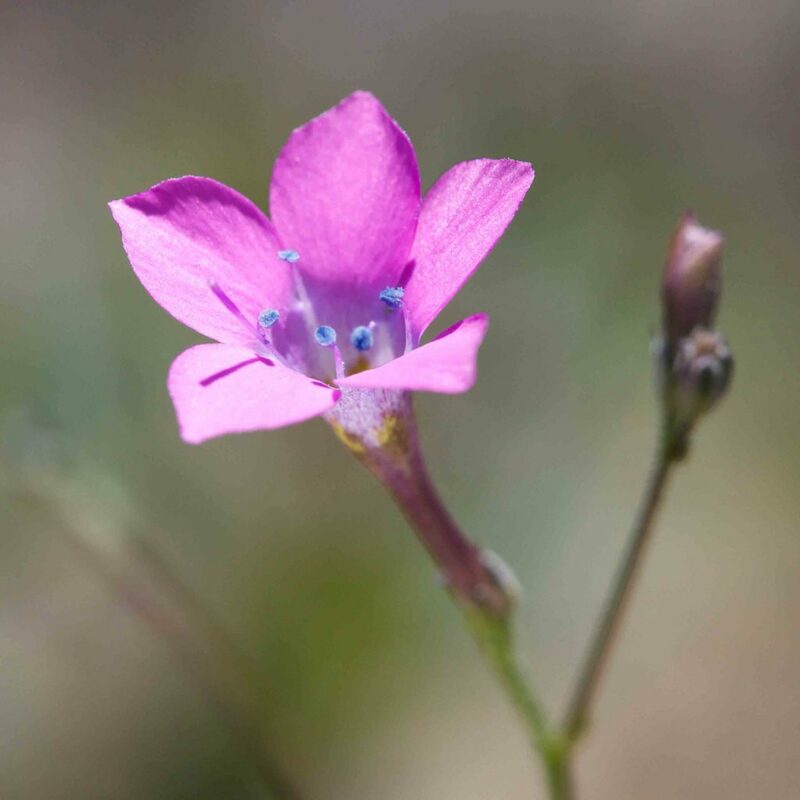 Like Straggling Gilia (Allophyllum divaricatum), this is a loosely branched plant with gilia-like 5-lobed pink flowers in clusters of 2–8. 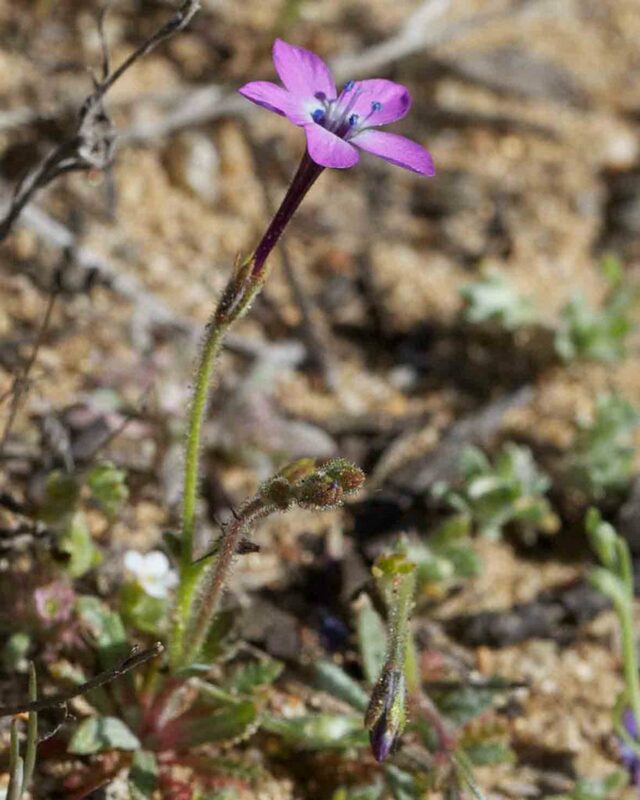 It can be distinguished by its smaller flowers (6–10 mm long) which have dark bluish-purple (rather than reddish-purple) tubes. 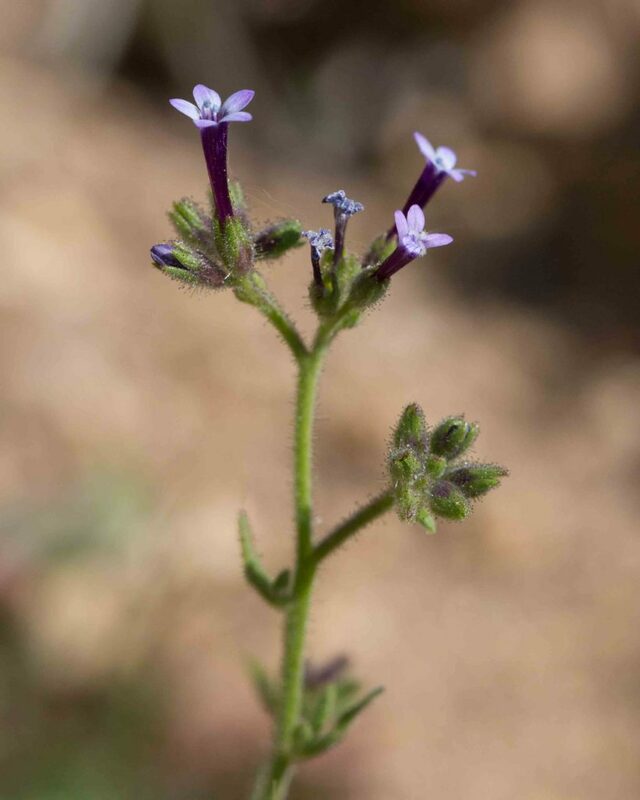 Also, the leaves are narrower and the glands short- rather than long-stalked. This is one of a small number of gilias with tight clusters of 5-lobed flowers in capitate heads. 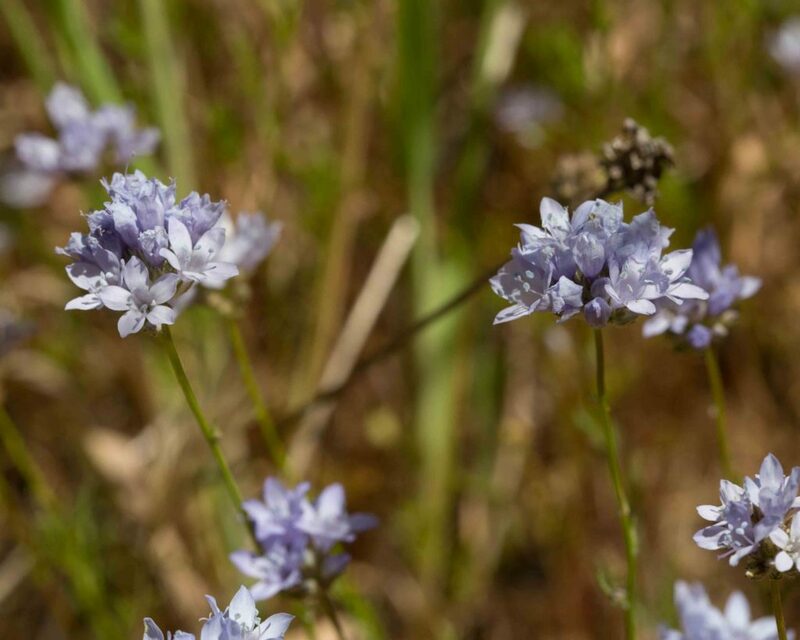 This one has 8–25 white to lavender flowers. The calyx is tufted-woolly-hairy or glandular. 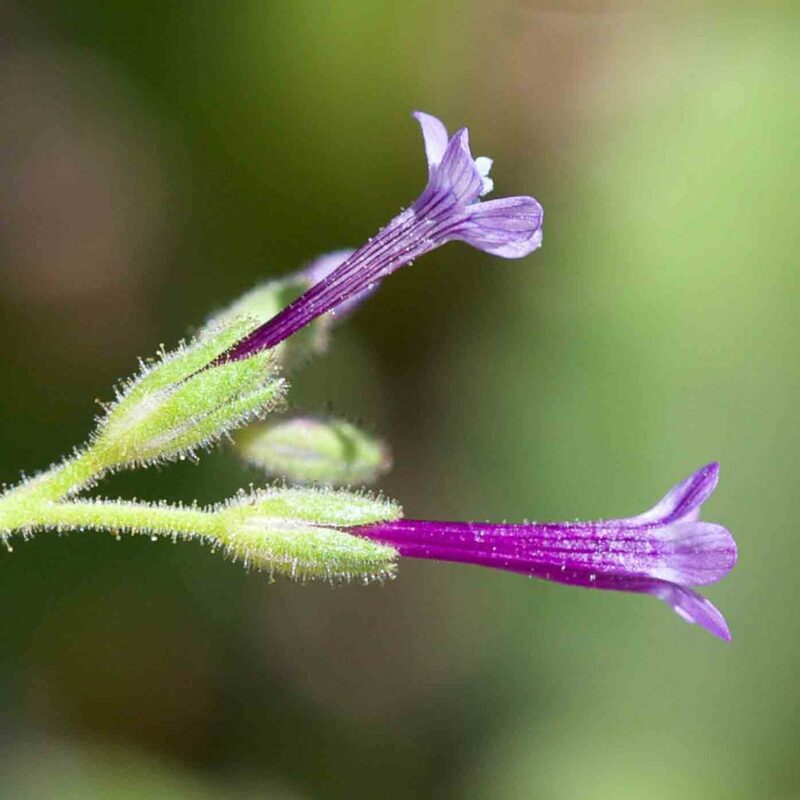 The stem has thin, feathery leaves. 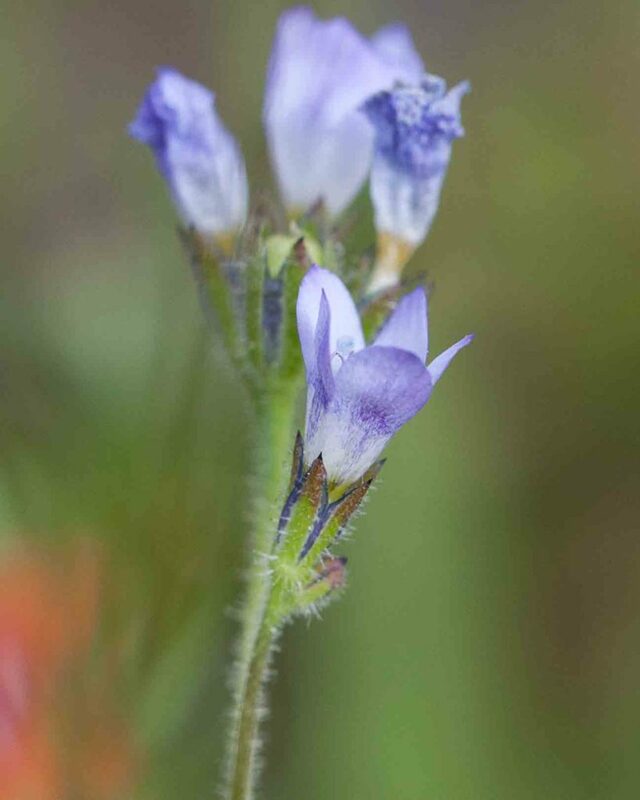 Often found growing with California Gilia (subsp. achilleifolia) and can be confused with few-flowered versions of it. 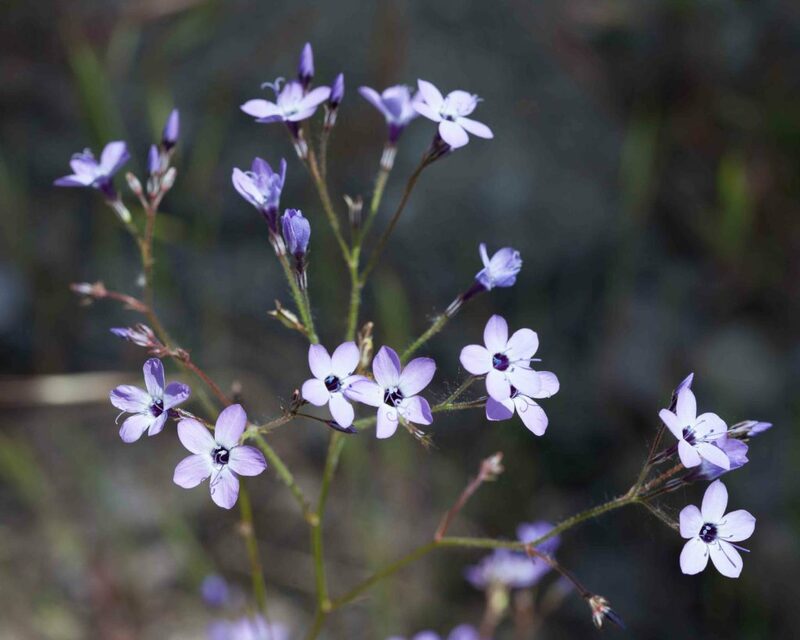 This subspecies (which Jepson notes may be better regarded as a separate species) does however have a somewhat different growth habit, with 1–7 flowers in loose cymes rather than tight clusters, If in doubt, count the number of flowers (including buds) carefully. 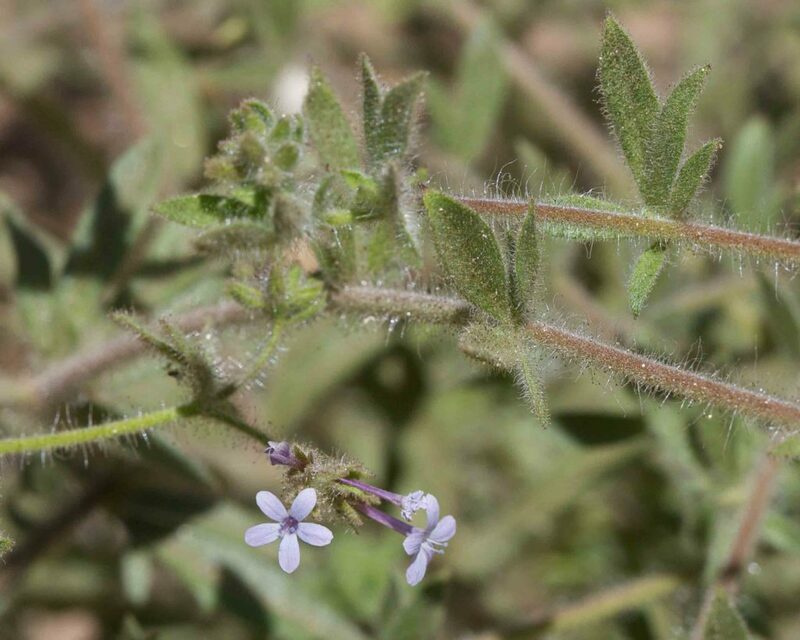 Pedicels may be long, 1–30 mm, compared to 1–2 mm for California Gilia. 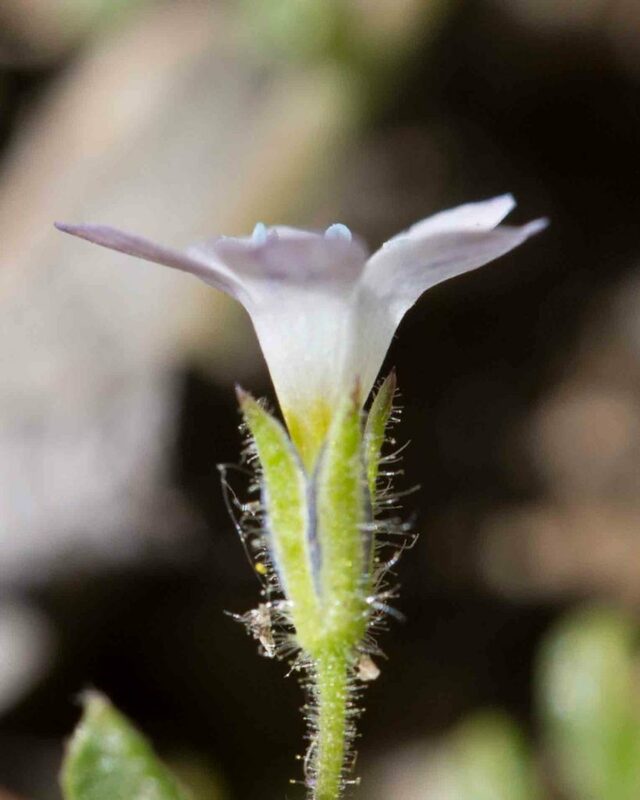 The stigma does not exceed the anthers but all may be more or less exserted beyond the corolla lobes. 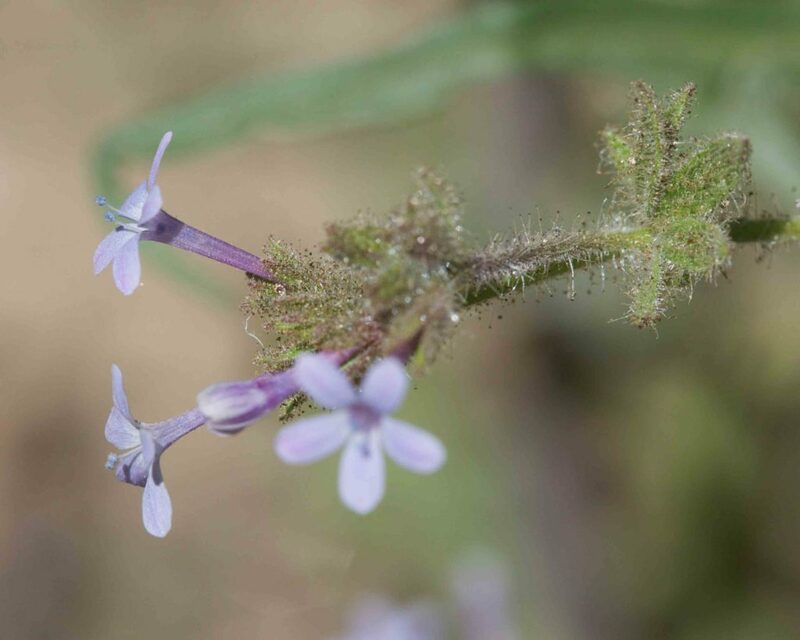 Leaves are similar in both subspecies but the stems in this subspecies is sometimes trailing. 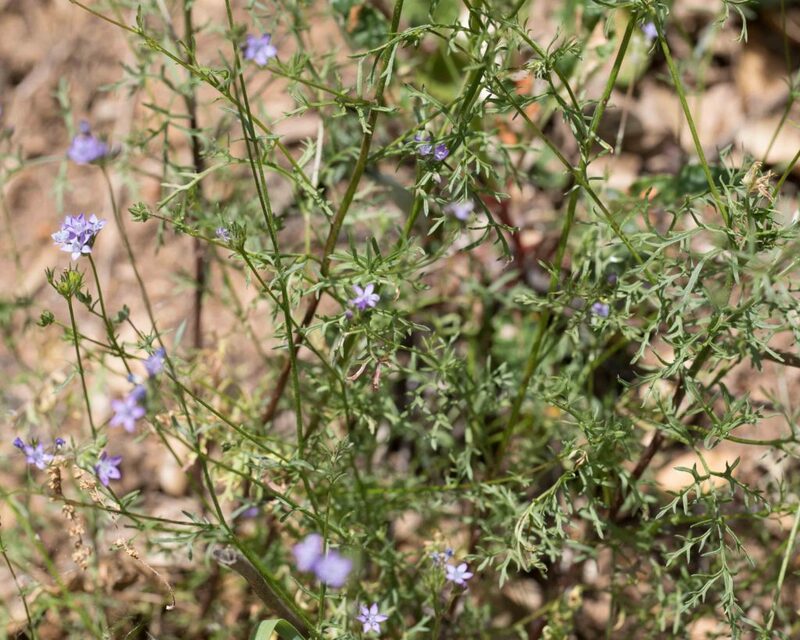 This small gilia has open clusters with 1–10 flowers. The corolla lobes vary from lavender to white and are no more than 5–10 mm across. The throat is yellow and has no purple spots. Pedicels are 2–3 mm long and glandular but the calyx is not glandular although it may be hairy. The calyx lobes are wider than the connecting membranes and the membranes are generally blue. 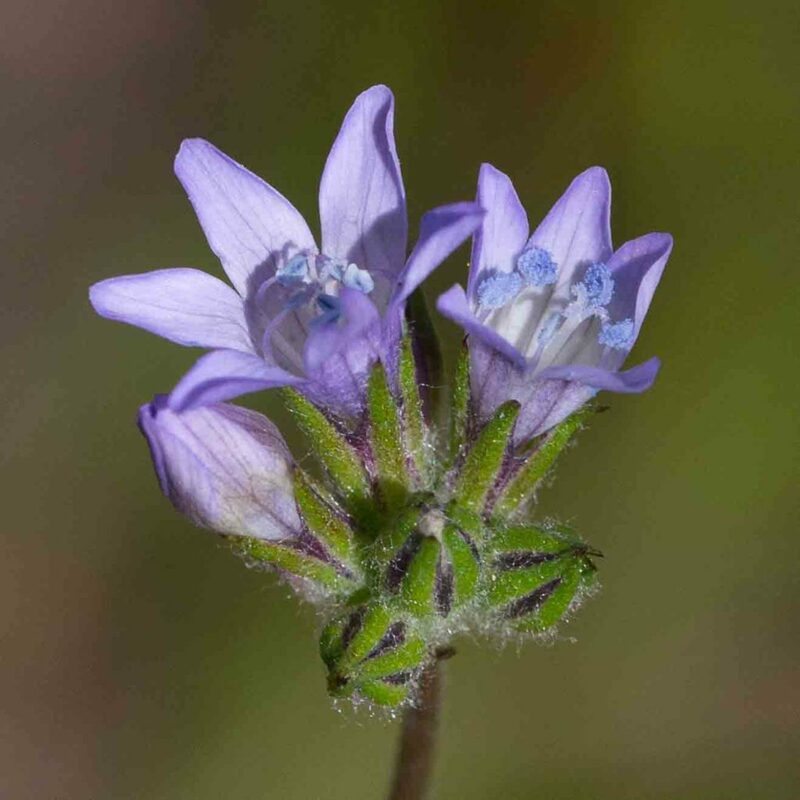 Too much reliance should not be placed on the color of the membranes since there are other gilia that have bluish or purple membranes but may have glandular calyces. 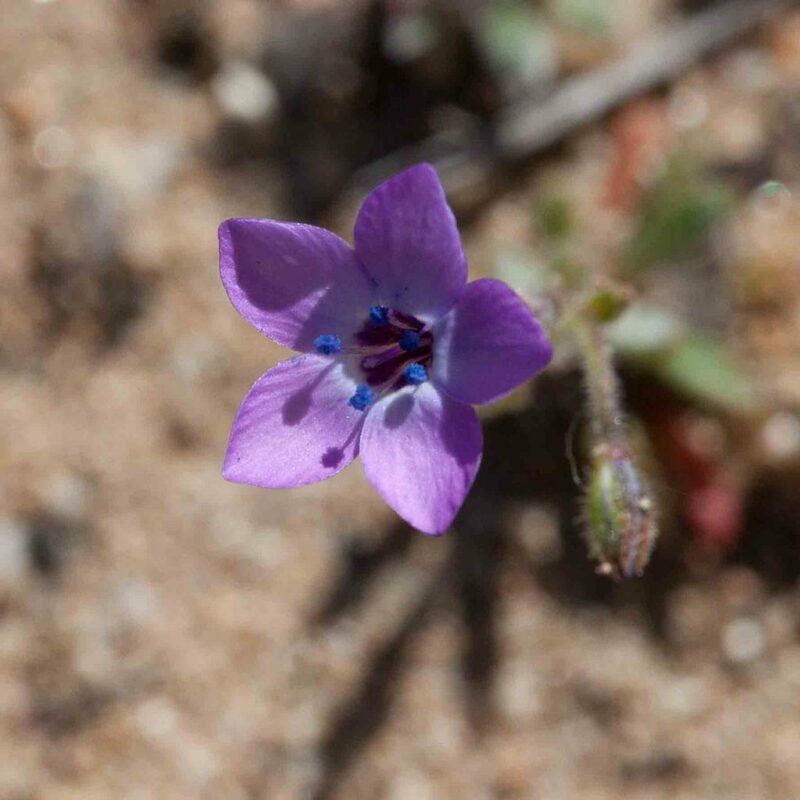 Like Chaparral Gilia (Gilia angelensis), this small gilia has open clusters but with 2–5 flowers. 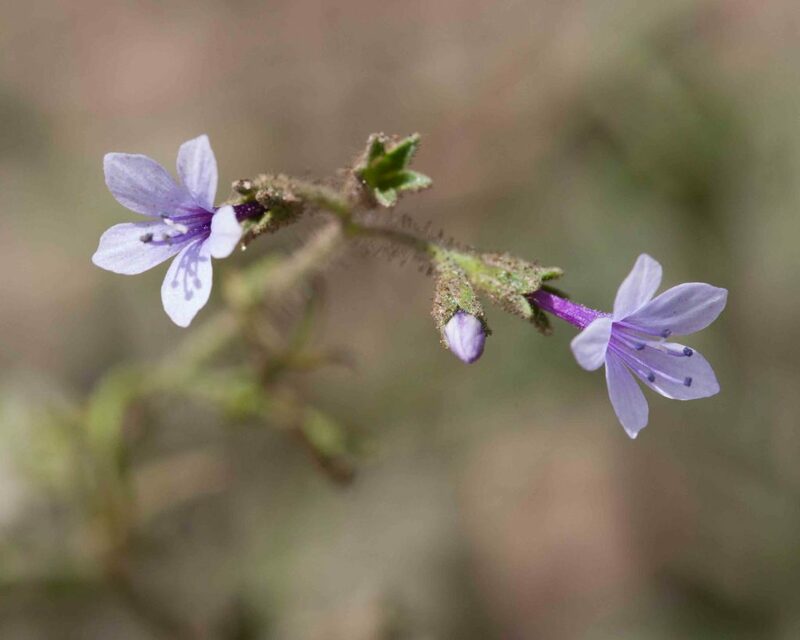 The corolla lobes are pale lavender to white and are no more than 6–10 mm across. The throat is yellow and has distinct purple spots. Calyx and stem are hairy and may also be glandular. 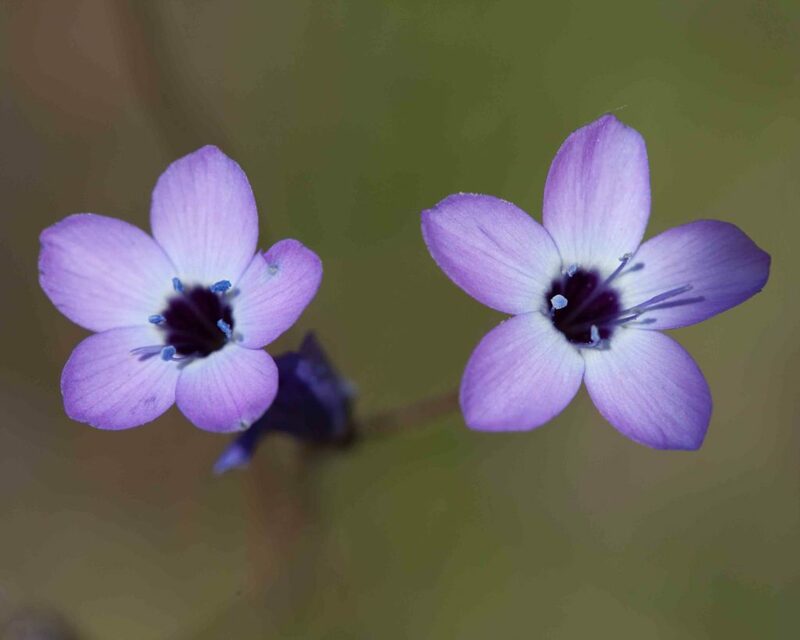 The calyx lobes are wider than the connecting membranes and the membranes are generally purple. 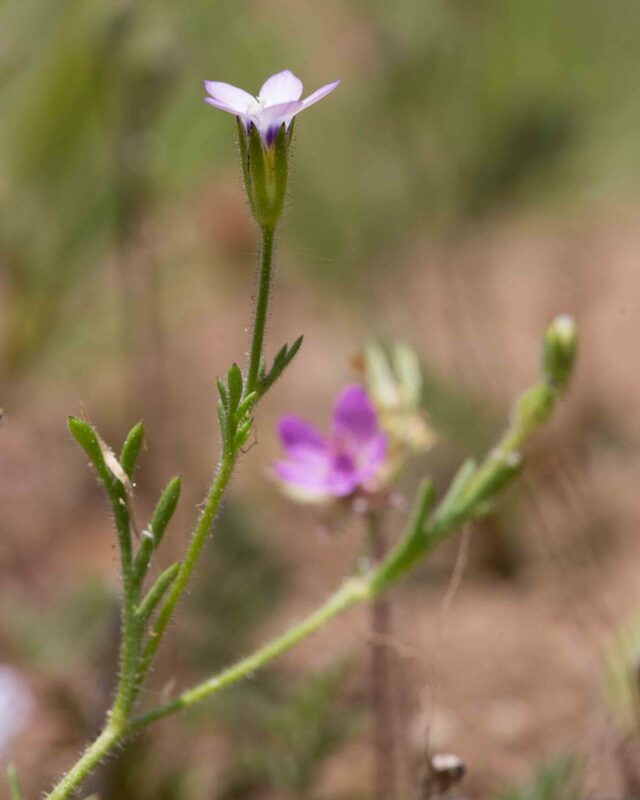 This tiny and rare plant has flowers with a long, slender, exserted purple tube and pink-lavender lobes. 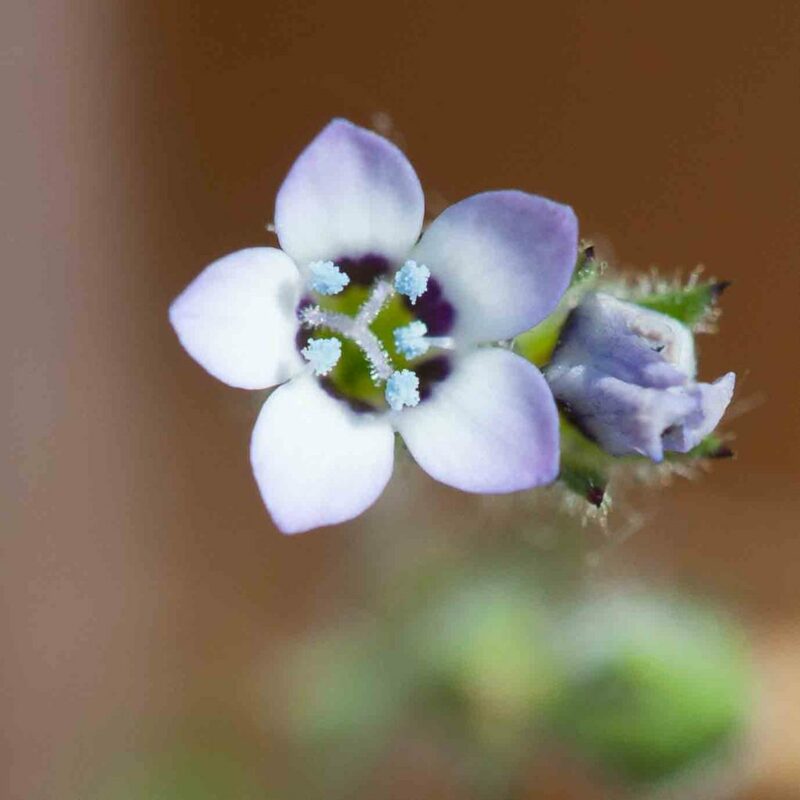 The flower is 10–14 mm long with 3–4.6 mm lobes. The base of the lobes is white and the throat purple. 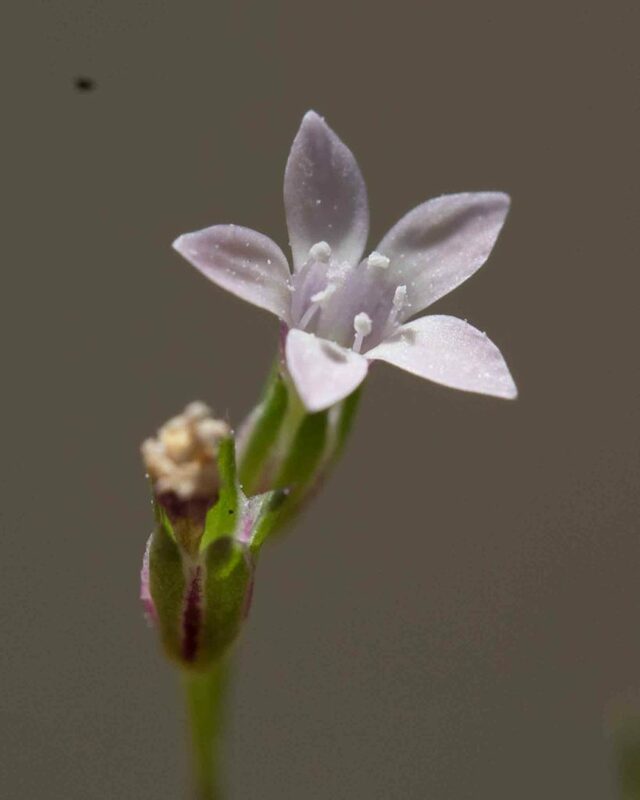 The stamens are barely exserted and not exceed by the stigma. 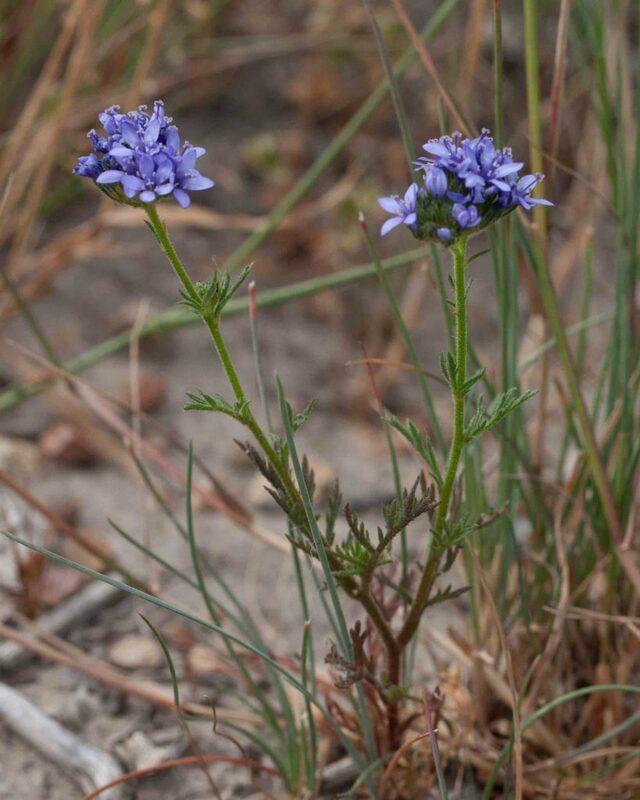 The plant has a basal rosette of small leaves. 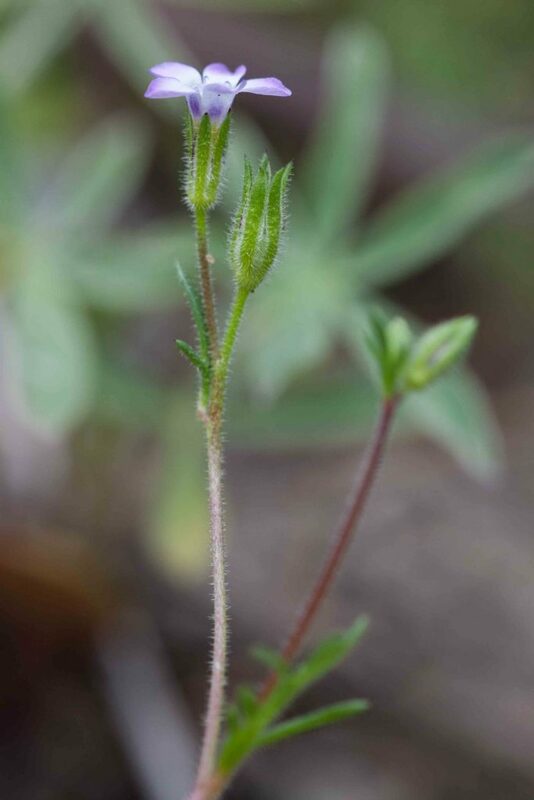 Stem and calyx are densely glandular-hairy and the base of the stem may be tufted-woolly-hairy. 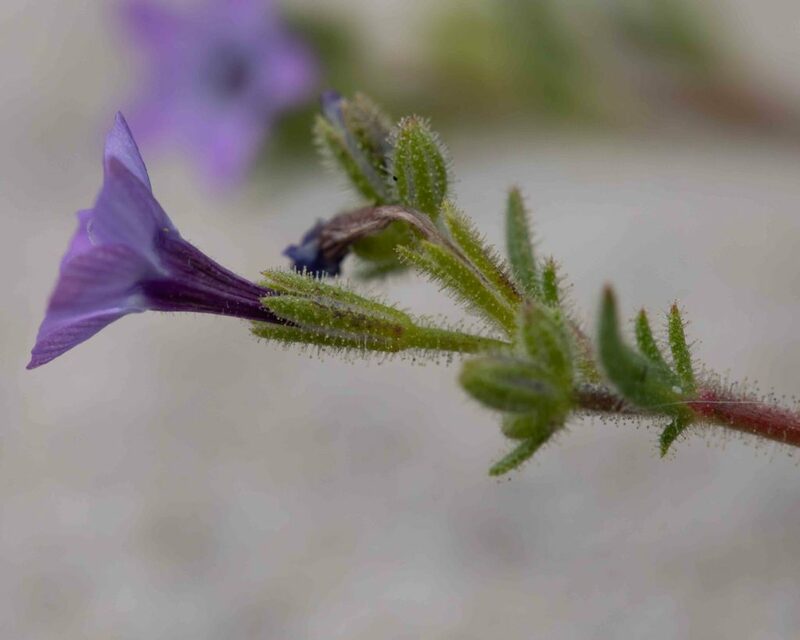 Like Monterey Gilia (subsp. 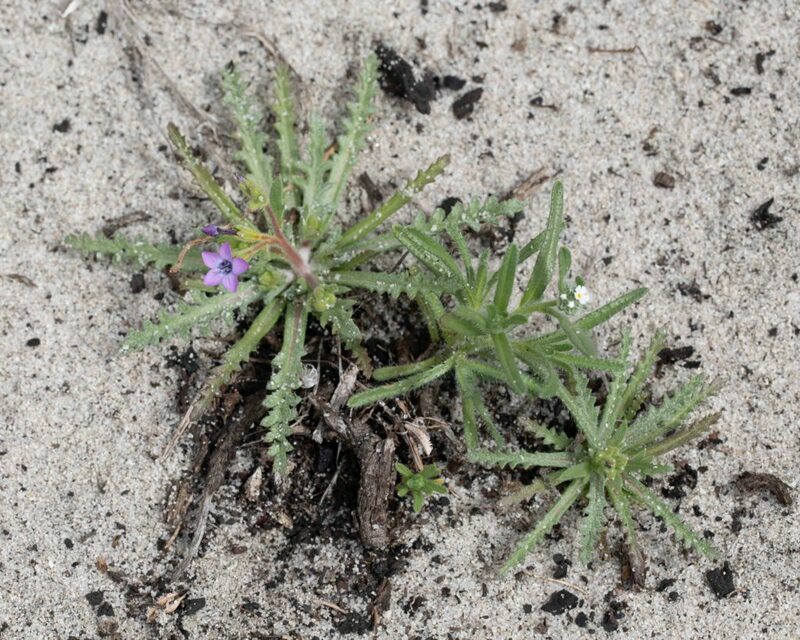 arenaria) this rather more common plant has flowers with a long, slender, exserted purple tube and pink-lavender lobes. 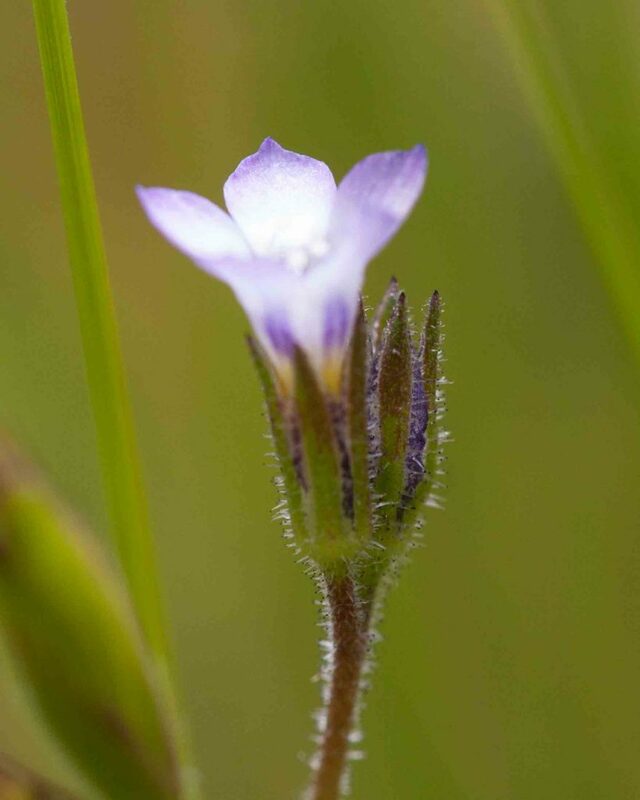 The flower is 11.5–22 mm long with 4–5 mm lobes. The base of the lobes is white and the throat purple. 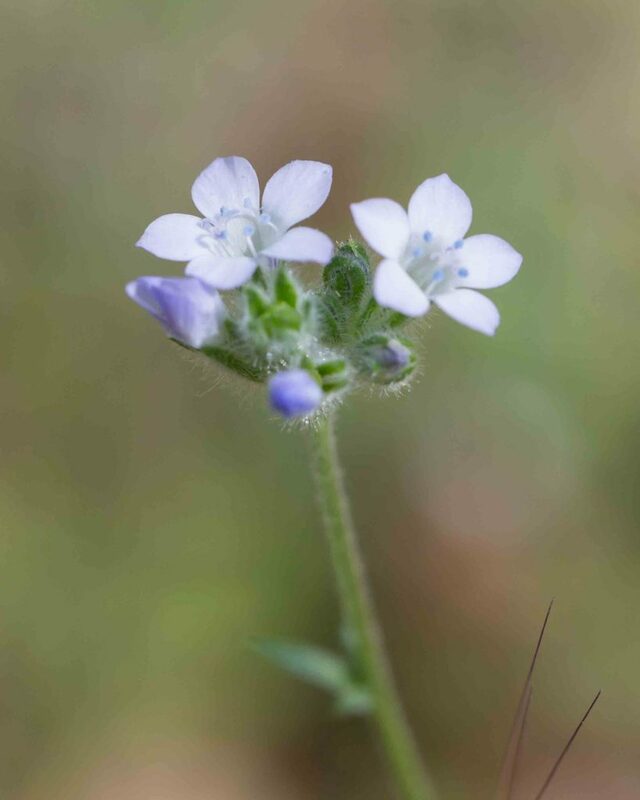 The longest stamens are exserted and the stigmas are longer than the stamens and anthers. The plant is much taller and much-branched. 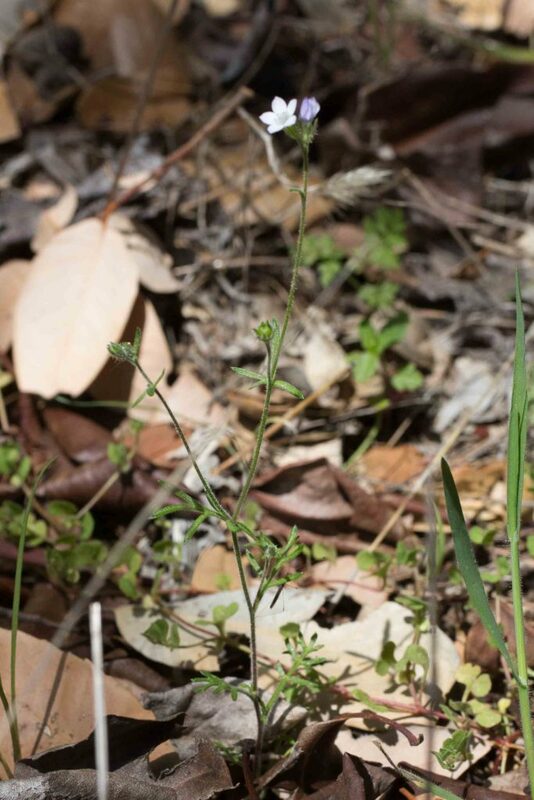 The stem is glabrous or tufted-woolly-hairy. Lower leaves are lobed and arranged symmetrically. 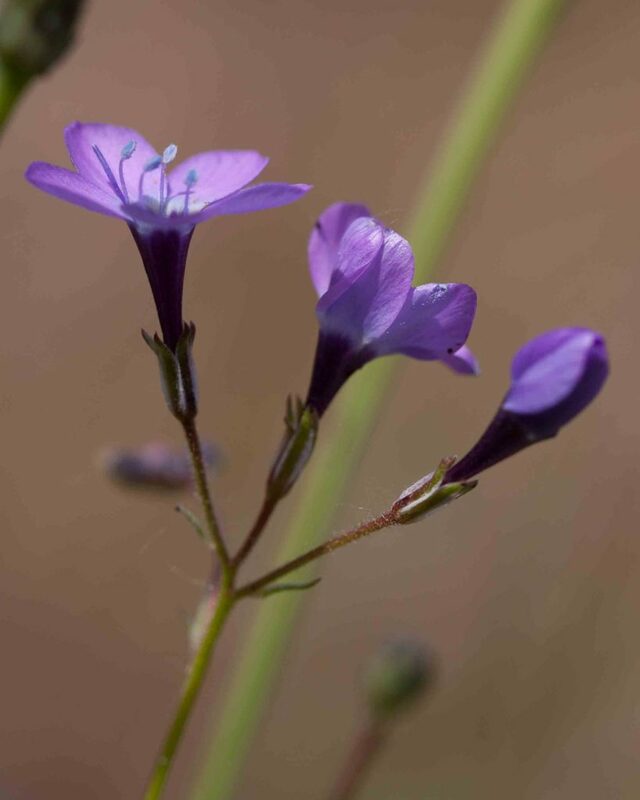 This gilia is uncommon in Monterey County, found mainly towards the south and occasionally introduced elsewhere. 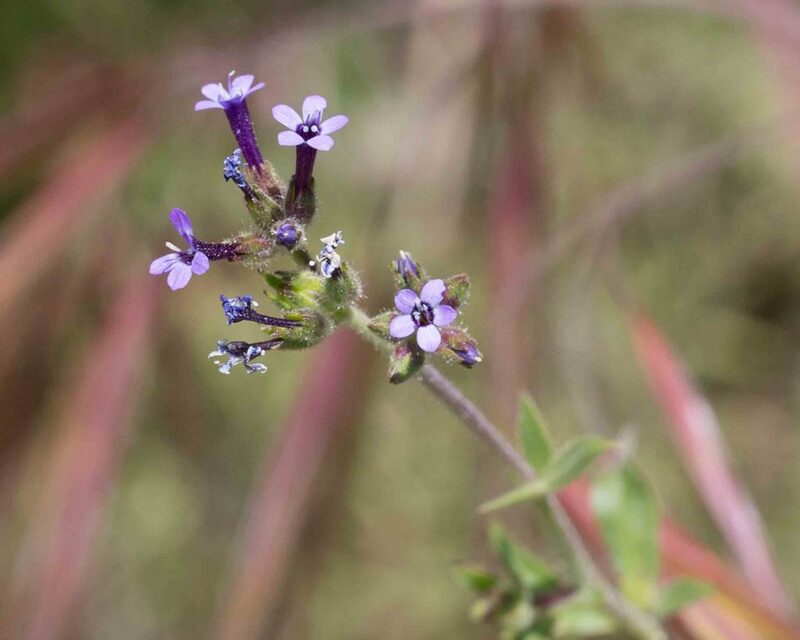 It has clusters of 2–5 flowers with pairs of purple spots in the throat which can merge into a distinct ring. 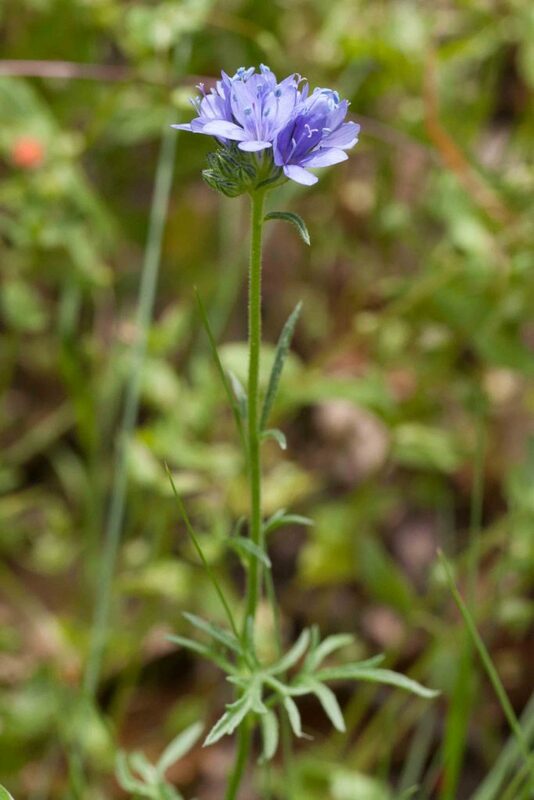 The throat is yellow and the corolla lobes blue-violet at the tip. Calyx lobes are not glandular and the connecting membranes are purple. 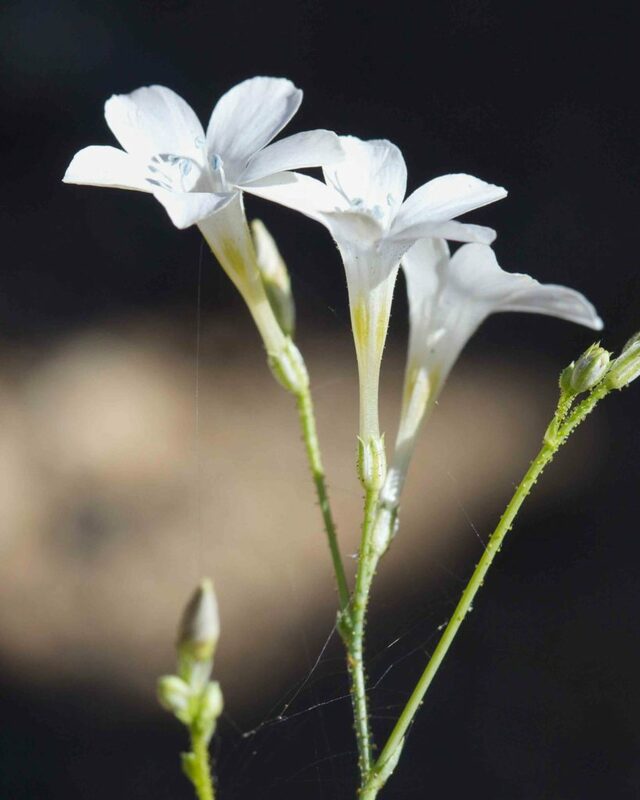 Formerly included in the Gilia genus but now separated out and distinguished by its stalked glands. 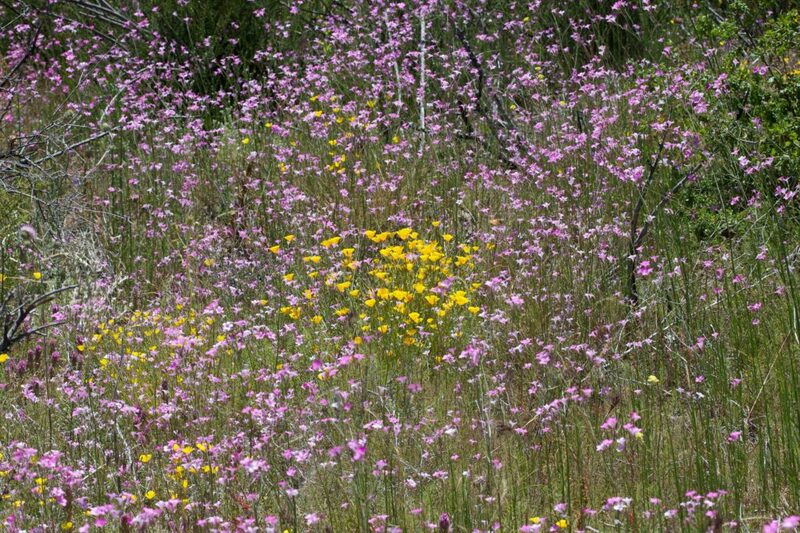 This can be a robust plant with many spreading branches and can appear in profusion following a fire, amply justifying its common name. The pink or white, funnel-shaped flowers are have a long (7–18 mm tube. The rosetted basal leaves are distinctive.